During my career, I have had far more experience in Treasury Bonds than any other market we trade. While it does not mean I will always be right…I’m not…I do tell myself that this is the market that I understand better than any other…and right now my “understanding” is screaming at me that Bonds are about to do what I have seen them do so many times before…and that is, surprise the living daylights out of 99% of the entire financial community. And for the record…this is the sell off that has occurred since then…and is, I believe, just getting started…. So…When I wrote that, a little over a year ago, right around Brexit and the upcoming presidential election, Wall Street was loudly telling the masses how precarious everything was, and advising investors to avoid Stocks and seek safety in Bonds…which, as we now know, was VERY bad advice…But was this just a onetime “bad call” from them…or is it more accurate to simply assume that it is RARE when they ever really get it right? And you know what I think…Anyone who actually believes that the major banks and brokerages know ANYTHING about where ANY markets are headed…AND THIS INCLUDES THE INTEREST RATE SECTOR…is blind to the reality of persistently wrong those people are…And to substantiate this, on the table below, just walk yourself through each year since 2000 and note how INACCURATE these guys REALLY are…year, after year, after year. Yes, there are a few people out there who get it right at times, but generally speaking…one more time…the overwhelming majority of them are nothing but well dressed, articulate wrong-way sheep…and to be clear…They are STILL telling you to NOT buy the stock market. And in the same vein, I would then emphasize that this tendency to be perennially wrong, or “off by miles”, does NOT just pertain to the stock market…IT APPLIES TO THE INTEREST RATE MARKETS AS WELL…and while I am certainly no trading genius, part of my ongoing record of often predicting where rates (and equities) are actually headed has stemmed from my understanding that the overwhelming majority of the supposed “logic” that comes from the pro’s ALWAYS sounds good…always QUITE logical…but is SELDOM on target…which IS definitively validated by those 17 year stats above…There ARE always bullish and bearish arguments to make about any market…but much more often than not, the one that ISN’T being heard (until the move is almost over) is the right one…which is where I think we are with Bonds and Interest Rates right now. The point is, in my opinion, Bonds ONLY have downside potential from here…with 25-30 points being an ultra-minimum objective…and I therefore think, if you ever speculate on anything, it is folly to NOT be short here. This IS going to happen. And the public, which has been fear-fed into buying, and buying, and buying bonds & bond funds for the past few years…while at the same time they were selling stocks, is going to get shafted, AGAIN, by the fat cats in New York…and as I wrote several days ago, the public’s liquidations, and staggering losses of principal, will be a BIG story sometime in the not too distant future. And just to put all that buying into perspective? Here is a century long perspective as to how low rates actually are…And, one more time, to Buy Bonds Here is a bet that rates will STAY down here…for DECADES…which I would offer, is NOT a smart move to be making. BONDS DO MOVE…OVER AND OVER IN 20-25 POINT SWINGS…AND I SAY THEY ARE ABOUT TO MOVE DOWN. Here are a few examples…followed by what today’s Bond market looks like…Decide for yourself if there are similarities. Interestingly, I can find no period in the history of Treasury Bond futures in which a consolidation like we’ve had for the past 9 months WASN’T followed by AT LEAST a 10 point move, one way or the other…which definitely makes a very strong argument for SOMETHING big happening here…and I DON’T think it will be on the upside. And also that I consider the odds to be SKY HIGH that, quite soon, or later, we are going to see a typical 20-30 point downside move within a just-as-typical 3 to 4 month timeframe. With this EXTREMELY firm opinion in mind, this leads me to conclude that it is worth it to own $1000-$2000 puts until this DOES happen, as, from a mathematical standpoint, if you do have to lose as much as 2 or 3 times…but are able to own options that I fully believe will be worth $20,000-$30,000 when this DOES happen, it DOES make sense to fund this idea until it DOES work. And I may be dead wrong, interminably, which could mean losing 100% on every option you ever buy, but I absolutely 150% think that this will happen…that this WILL work…and realistically speaking…NOT in the too distant future. As I just put that last thought into print (leading to my comment at the top of this newsletter), I then sat back and said out loud to myself, “This is f***ing TRUE. This is TRUE. All you have to do is execute the plan. This IS going to happen. Just be there. Stay there. Execute the plan and it can be a grand slam.” AND THAT IS ABSOLUTELY CORRECT. I SAY THERE IS NO, NO, NO WAY THAT BONDS STAY UP HERE. AND THERE IS NO, NO, NO WAY THAT THEY TRADE FOREVER SIDEWAYS…AND THAT THEN ONLY LEAVES ONE OTHER POSSIBILITY….DOWN. …Which makes this one way bet following, the December 152 put, extremely attractive as the place to be until year’s end…with the understanding that if it does not produce a winner, it will only mean the market is still at current levels, or higher, and therefore, the bet is still there to be made, with ANOTHER $1200 put…with another 3 months of time. One – The June contract below still assumes there will be only one 1/4% rate increase in the course of the next 10 months. I think this is ludicrous. Two – The fact that this contract, which IS in a downtrend, bounced in March and has been sideways since April, does NOT mean Eurodollars have made a truly bullish turn…As stated in previous letters, markets do two things: move and consolidate…and I firmly believe we are about to MOVE…and it WILL be down. Three – The fact that this trade was working…and then stopped working…has been painful, but meaningless as to what comes next. Sometimes this business is just a question of hanging in there…and not giving up, psychologically or financially. This market is about to go down again…HARD…That is just my opinion, and I might be dead wrong, but I am just as strong in my belief as I have been for the entirety of this year. 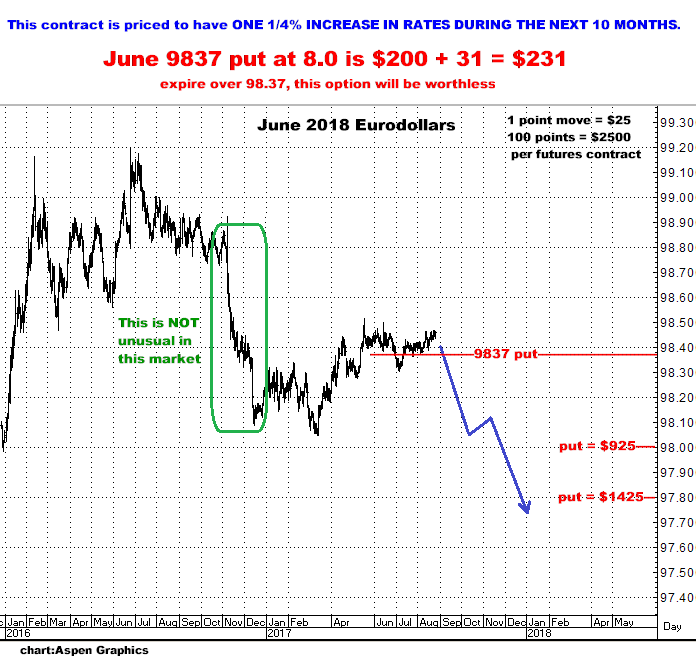 I would definitely recommend buying this June 2018 Eurodollar put in combination with the December 152 Treasury Bond put…with something like units of 5 Eurodollars ($1155) and 1 Treasury Bond ($1201) for a total cost of $2356. Go back to the charts and do the math yourself for what the results might be dollarwise. IT DOES NOT MEAN I WILL BE RIGHT, BUT I CAN HONESTLY SAY I HAVE NEVER SEEN A BETTER TRADE IN THE INTEREST RATE MARKET IN ALL THE YEARS I HAVE BEEN DOING THIS…BUT YOU DO HAVE TO STAY ON IT TO MAKE IT HAPPEN. Give me a call and let me know what YOU think?